There are some changes coming to the dining room soon that I have been working on since the first of the year. I love my hutch, but have really been longing for an antique hutch from France made with beautiful wood and a pretty patina. This is what I have been on the hunt for on all my antiquing excursions. Problem is the piece I long for is no where to be found around here. So I shopped on Ebay and found a few things that would work. One piece that I had saved to my "wish list" was the one piece I knew was perfect to replace my black hutch. I called and spoke to the seller and he and his wife sell French and English antiques. They have pickers that find them pieces and then they are shipped to them. He and his wife also spend every August in southern France picking themselves. Gosh how much fun would that be? I placed an order with him and am patiently waiting for it to arrive along with something else I purchased from him. Here is a peek at what I'm waiting on. It's very similar to the vaisselier in the sitting room except it's a bit narrower, but taller. A vaisselier is a French hutch. I have also been on the hunt for new chairs since the chairs I've been using need to be sold with my yellow dining table that I used to have in the breakfast room. Tables sell better with the chairs. I had been eyeing the chair above on shop houzz, but they were quite pricey for just a pair of them. While visiting a shop, next to the shop where I bought my chalk paint for the curio cabinet, I noticed they had four of the exact same chairs I've been wanting and basically the four were the same price as the two on houzz. Score! So glad I just happened to visit the store for the paint that day and ended up finding these chairs. These chairs are covered with hemp with a herringbone patterns and white oak wood that has a lime finish. They have big springs that even show some through the black lining on the bottom and are overstuffed and comfy! Here is an old photo from 2012 of the yellow table and chairs. I purchased this set this way and the yellow distressed finish is the way they came from the manufacturer. I think this set may be by Bramble since this shop carries some of that line. I later painted the chairs a beautiful pale gray and distressed them in spots to where the yellow shows through. If anyone is interested in buying the table and chairs, pick up only, just let me know before I take them to the consignment shop. I live northeast of Atlanta. I think I may sell the hutch, too. I thought about using it in a guest room, but I may let it go. I just need stuff cleaned out before the new gets here. Now, y'all know why I needed the curio cabinet I just refinished. I am VERY curious to see your new vaisselier. Here's something: it comes from the word "vaisselle," which is the broad term for dishes and china. You really should come visit me if you want to hunt for antiques in the south of France! 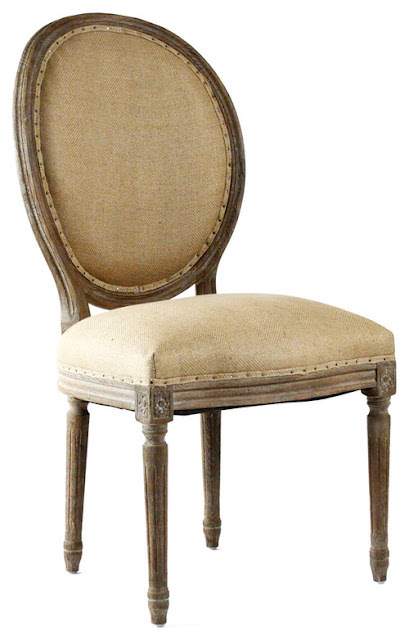 Those classic Louis XVI chairs are very comfortable, with plenty of padding and just the right angle. We have the same, but the backs are cane. They are old, old, old, but don't show it. Oh, would't that be fun! I am promised a trip to France after hubby retires hopefully in the next couple of years. I would have loved the cane back chairs. Love those! OK. Put Carcassonne on your list. That hutch was always my favorite thing in your dining room! I will be sorry to see it go. Can't wait to see the dining room of your dreams! Sounds like these are some amazing changes! Uh- Oh---when you started I was sure whether to be excited or scared. lol I love what you are going to do and I LOVE that hutch you are getting rid of...if I lived closer that would be strapped to my back to get it home. How very, very exciting! Can't wait to see all the changes unfold! I agree Linda Darling! That hutch brought me to this blog years ago, and inspired me to pick up a paint brush, buy some chalk paint and begin painting pieces of my own furniture. Sounds awesome, Kim, and I can't wait to follow the progress! Funny thing is I'm working on my dining room too... :-) I actually just got the sconces I see in yours! And a few other things. Hubby just doesn't get why a room looks finished to him and I see a room that needs work... lol. It's always fun to see you get rid of something I think is gorgeous, and then you replace it with something even better!! Sounds great Kim...enjoy your new pieces when they arrive! Your new piece looks gorgeous. I loved your hutch when you had it painted distressed gray with the blue mottled interior. Ooohhhhh!! How exciting for you Kim. You know I am a sucker for change ☺ can hardly wait to see what you come up with. Kim, I know the new piece is going to be awesome, but I'll miss the black hutch. Your dining room is a favorite for me. I look forward to seeing your new pieces. The hutch is awesome, so it must be something special that you are replacing it with. I love those rush-bottom chairs, Kim! How much are you going to ask for the set? They went to a consignment shop. I love your hutch, but I understand the need for a change... And I can't wait to see the new/old vaisselier.